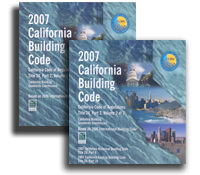 For those not familiar with it, the California Title 24 Building Standards Code consistes of 10 fairly hefty binders containing over 4,614 pages of small text. The entire set costs a little over $1,000 and Architects are expected to know or at least be aware of all of it. Not surprisingly, a lot of our time is spent scouring over the code trying to make sence of it all. Yesterday a coworker of mine and I stumbled across this little gem of the building code when designing the threshold into an accessible shower stall for an apartment building. Showers in commercial and public buildings are referenced in section 1115B.4.4.2. I understand the logic of making the restrictions less stringent, 2″ for private units then 1/2″ for common and public spaces. But why the more stringent 1:2 sloped bevel for private uses, then the more relaxed 1:1 slope for common spaces on private property and back to 1:2 slope for public spaces? Why not just make it all the same and make things easier for all of us? Just a little disclaimer: The content of this post is my interpretation of the code. I may be 100% wrong so don’t use this to design anything.